Built-in rechargeable Li-ion battery charges quickly in 1.5 hours and provides playback for 6 hours and up to 30 hours of standby time.Fully charged the battery before using it the first time. 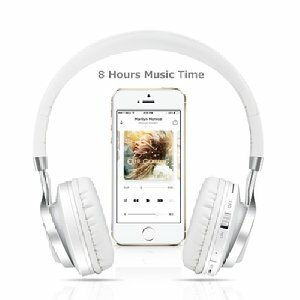 While the built in 300mAh rechargeable lithium ion battery charges in a rapid 2 hours, it provides for up to 6-8 hours of continuous music playback or up to 12 hours of continuous talktime on a single charge (Max ratings at 50% volume). A premium aux cord is also included so you can connect the headphones manually if you choose. STELLAR SOUND QUALITY: Bluetooth 4.0 and A2DP streaming technology come together to ensure that everything you hear is in its richest tone and quality. No static, no background noise. Just high bass sound and 100% enjoyment! PU leather headband for perfect fit. Custom fit supra-aural soft earmuffs, artificial protein leather of earmuffs simulated to human skin texture, ensure long lasting comfort in various rugged circumstances. 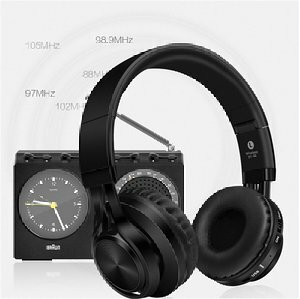 Retractable&Foldable Design:The adjustable band gives you a good fit, it doesn’t hurt your ears. And thanks to this foldable design, it’s easy and space-saving to put in your bag, they are also great for traveling! The BT-06 gives you a memory card slot too. 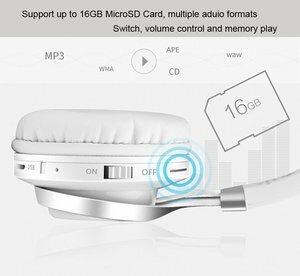 Simply insert Micro SD card (NOT INCLUDED) in the slot and enjoy your MP3 player on your headphones. 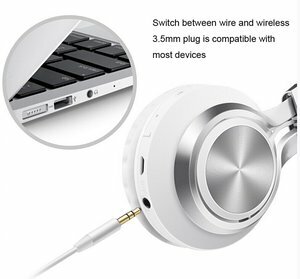 It is not only a bluetooth headphone, but also a wired headset, just a plug with audio cable(1.5m audio cable is included), then listen to your favorite tracks without using any battery. Perfect for use while working out, enjoying your favorite sport, relaxing at the beach, between meetings for work, or waiting at the doctor’s office.